A crab is a crustacean, a sea animal with claws and five pairs of legs, and also the flesh of this animal served as food. 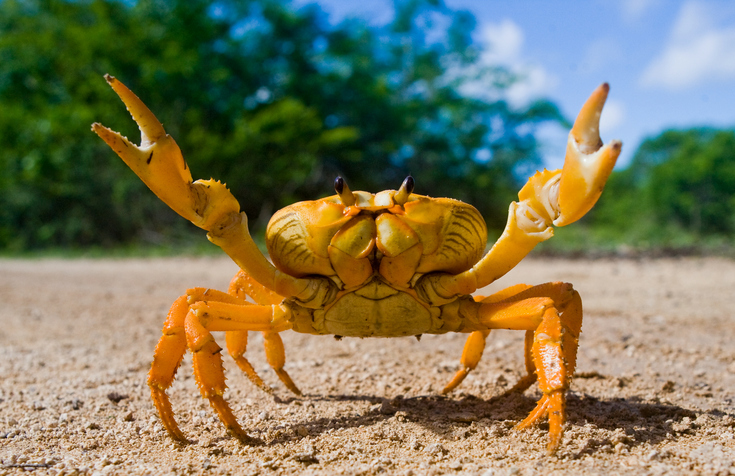 As a verb, to crab means ‘to fish for crabs’ and also ‘to move sideways,’ resembling the way these animals move. Unrelatedly, and informally, we call an ill-tempered and unpleasant person a crab, and the related verb means ‘to find fault and complain.’ Mainly in US English, if you crab something, it means that you spoil it, but this meaning isn’t very common. The crab scuttled across the rocks and into the pool. James loves seafood, especially crab. The children spent much of the day crabbing in the rock pools on the beach. The burglar crabbed along the wall, keeping in the shadow. The boss is a bit of a crab, but you'll get used to him. I wish you'd stop crabbing all the time; can't you find something positive to say? Maria was annoyed with Karen always crabbing her plans. A crab is also a crab louse—a type of louse that infests pubic hair. They are usually referred to in the plural, as crabs, and are mainly caught through sexual contact. Crab apples are wild apples, which are more sour than most cultivated varieties, or cultivated varieties that also have a sour taste. It is from this that we get the meaning of crab as an unpleasant person—someone who is sour and bitter like a crab apple. That’s where Edna Krabapple in The Simpsons gets her name, because she is often irritable and crabby, as you can see in this clip (although, in fairness, Principal Skinner is being pretty crabby too). Crab dates back to before the year 1000. The Old English crabba, later the Middle English crabbe, comes from a Germanic root, though the exact path into English is unknown. It is related to the Dutch krab, the Old High German krebiz, the German Krabbe, and Old Norse krabbi, all meaning ‘crab.’ It can be traced back to the Proto-Indo-European root gerbh-, meaning ‘to scratch or carve,’ and is also related to the English verb carve. Crab, meaning the fruit of the wild apple tree (also called crabapple), dates back to around the year 1300, and its origin is unknown, though it may have come into English from a Scandinavian language (compare with the Swedish krabbäpple). Figurative meanings, most importantly calling an unpleasant person a crab, date to the mid-14th century, and are likely a back-formation from the adjective crabbed, meaning ‘angry or ill-tempered’ (nowadays, crabby is more common). There is some debate as to whether this is because they take a combative stance, like the crustacean, or they are sour, like the fruit. Perhaps there is some truth to both. The verb comes from this use of the noun.